Smoke from the Harris Fire drifting over Sweetwater Reservoir, San Diego County, California. Photograph taken by Michael S. Majewski, U.S. Geological Survey, October 2007. About half of the water supply in the southwestern United States is supplied by water from forests, which generally yield higher quality water than any other source. Approximately 80 percent of the freshwater resources in the U.S. originate on forested land, and more than 3,400 public drinking-water systems are located in watersheds containing national forest lands (USDA, 2006). More than 12 million acres of land, including important forested water-supply watersheds, have burned in the southwestern U.S. in the past 30 years. Wildfires increase susceptibility of watersheds to both flooding and erosion, and thus can impair water supplies. Wildfires can compromise water quality both during active burning, and for months and years after the fire has been contained. During active burning, ash can settle on lakes and reservoirs used for drinking water supplies, like during the 2013 Rim Fire. Storms following wildfires are known to impair drinking water supplies in the southwestern U.S., as burn areas are prone to greater rates of erosion, increasing the downstream accumulation of sediment in streams, rivers, and reservoirs. Thus, the potential impacts from past, current, and future wildfires on the quantity and quality of runoff are considerable, and may greatly impact water used for domestic, agricultural, and ecological water supplies. The USGS works with local, state, and federal agencies and resource managers to identify and evaluate issues related to wildfires. Decision makers rely on USGS data to assess and manage the effects of wildfire on California's water and ecosystems. Near-real-time maps and satellite imagery help fire managers monitor current wildfire extent and behavior. Water quality, flow, and sediment data from USGS studies may help managers evaluate the cumulative effects of fire and potential water-quality impacts on drinking-water supplies. Climate and hydrologic modeling can aid in fire forecasting and help inform fire management strategy. Wildfires increase susceptibility of watersheds to flooding and erosion and can have both short- and long-term impacts on water supplies, such as increased treatment costs, need for alternative supplies, and diminished reservoir capacity ( Smith et al 2011 ). 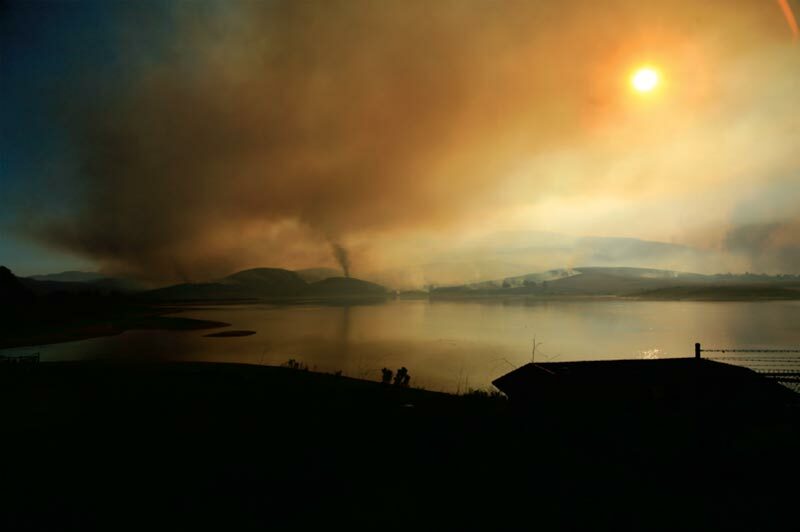 The degree to which wildfire degrades water quality and supply depends on multiple factors. These include the extent and intensity of the wildfire, post-wildfire precipitation, watershed topography, and local ecology. Drinking-water utilities strive to provide safe drinking water for their communities. Unfortunately, the unpredictable nature of wildfire makes it challenging to develop treatment-plant-specific strategies for treating source water degraded by the effects of wildfire. High-intensity rainfall events in steep, burned watersheds are likely to move large amounts of suspended and dissolved material into downstream water supplies. The USGS monitors water quality and sediment characteristics in rivers and reservoirs affected by fires. This data helps scientists and water managers evaluate the cumulative effects of fire, and potential water-quality impacts on drinking-water supplies. High-intensity storms can affect water quality years after a wildfire, Monitoring source water downstream of burned watersheds allow water managers to minimize adverse water-quality effects, such as by temporarily diverting compromised water or changing source water. 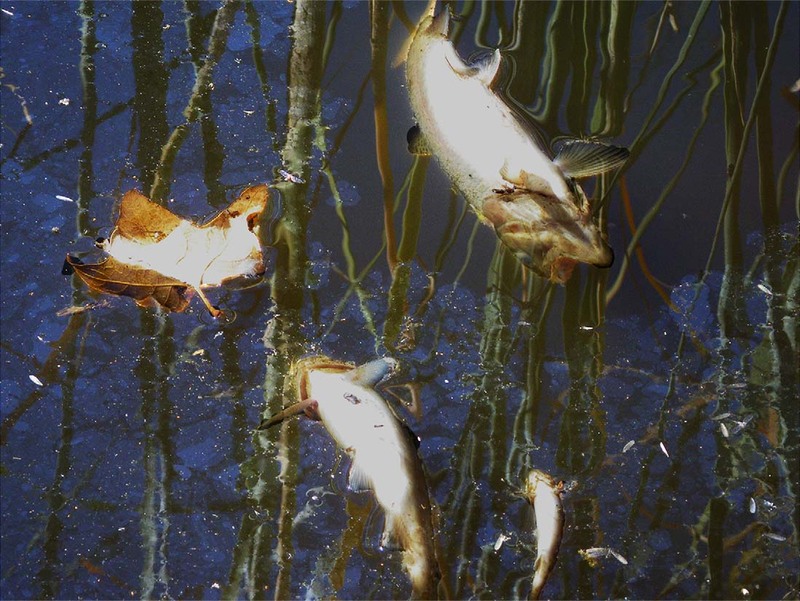 Dead rainbow trout (Oncorhynchus mykiss) in the Big Tujunga Watershed during the 2009 Station Fire, California. Photo: USGS. Post-fire runoff can also harm ecosystems and aquatic life such as fish and frogs that live in affected watersheds, some of which are critically endangered. Understanding the effects that wildfires have on local water quality helps resource managers plan for and manage contaminants, conservation, and treatment processes. Urban fires, more than forest fires, result in an increase in chemicals and contaminants. When rains come, contaminants from urban ash and debris can be mobilized by the rainfall runoff and associated wind. These contaminents have the potential to seriously affect the quality of water supplies and sensitive habitat areas or ecosystems. In a study published in May 2016, USGS scientists noted the presence of multiple trace metals in post-fire storm water. Scientists discovered elevated levels of iron, lead, nickel, and zinc in the streams near Los Angeles, and traced the contaminants back to the 2009 Station Fire in the nearby Angeles National Forest. The study examined the effect of the fire on trace metal contamination in nearby streams, comparing post-fire stormwater quality to criteria for aquatic life. Studies like these help USGS and its cooperators understand how contamination from fires could harm local ecosystems.